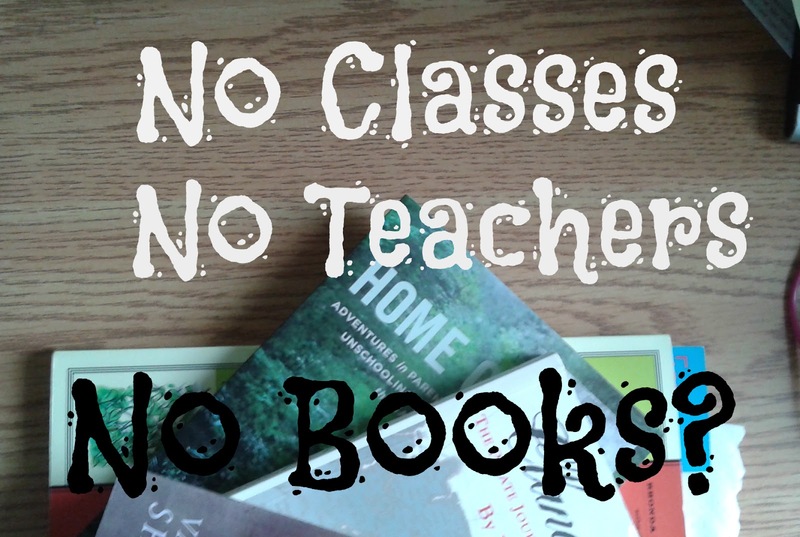 I can’t count the number of times I’ve seen article headlines proclaiming “Unschooling: No Classes, No Books!” I always shake my head in frustration. 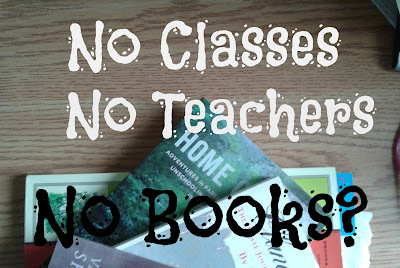 I suppose when people hear that unschooling is not school, they jump to the conclusion that any and all even vaguely school-like trappings of classes and teachers--or even books, apparently--must be thrown out the window. Not school must mean nothing that looks like traditional learning, and nothing that looks like structure. The reality, though, is quite a different story. Unschooling is characterized not by its lack of structure, but by its flexibility. There are classes. As children me and my sister went to co-op classes and French classes and science classes. In recent times I’ve been to dance classes. My sister has been taking Ninjutsu for years, which at this point in time means two classes a week with an extra practice day thrown in. 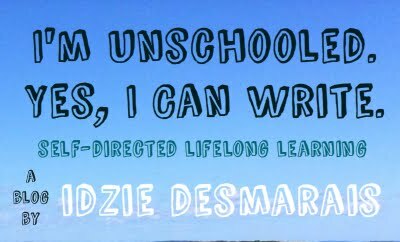 Unschooling is self-directed learning, which means you choose what classes you take (or don’t take). What it isn’t is learning only by yourself with no help. I’d hope that everyone can recognize that learning in group settings can be helpful and fun for some people some of the time. Would I like to only ever learn in class settings? Definitely not. But sometimes, it’s really great, and no one should ever believe that unschooling means shunning a specific type of learning just because it looks traditionally educational. It’s all about choosing what works best for you. There are teachers. Not only present in classes of various sorts, but also in one-on-one situations. Sometimes the best way to learn something is by seeking help from someone skilled, which means a teacher or mentor of some sort. It may end up looking like a familiar school teacher-student relationship, or as is more often the case, it might hopefully be a more mutually respectful and reciprocal relationship. I have learned so much from other people: learning in isolation would be a sad and, well, isolating thing indeed. But by freeing ourselves from the need to be taught, I (perhaps ironically) feel that we can become much more open to all that is to be learned from those around us and those we seek out, both professional teachers, “experts,” and community members. There are books. In some cases, lots of books. In my house, the house I grew up in, there are two over packed bookcases in the living room; a bookcase stuffed with cookbooks in the kitchen; two bookcases in my bedroom; one in my parents room; two bookcases plus towering, precarious stacks shoved everywhere they can possibly fit in my sister’s room; and I don’t even know how many more bookcases are scattered around the basement. Point being? Between us, my family owns a whole lot of books. The internet provides lots of useful information and access to a ton of terrific essays and stories, but there’s still a lot to be said for both novels and nonfiction books. It seems absurd that I should even have to say this, but generally unschoolers like books a lot. While some people are never going to really enjoy reading books for pleasure (or will be unable to due to learning disabilities), the vast majority will at the very least use books when appropriate to get the information they need. We’ve established that some unschoolers will appear more “school like” in their pursuit of knowledge, or in the ways they choose to structure their learning. But while that may be one sort of “structure,” even for the most freeform unschoolers out there, the patterns of life will create a structure of sorts. Daily habits and rituals, visits and activities, will build a scaffolding for the unschooling life, a structure that evolves and changes over weeks and months to support the needs of each individual and the family as a whole. Unschooling doesn’t mean doing away with any structure whatsoever: it means creating a structure based on the needs of actual people, instead of following a structure designed for the needs of an institution. This means that sometimes unschoolers will go to classes, seek out teachers, and read books. And sometimes, they’ll learn quietly by themselves, they’ll teach themselves a new skill, and they’ll play a video game. However much or little structure their lives end up including, life learners are trying to open themselves up to as much of the world as possible. To pick and choose what works for them, and discard what doesn’t, all with the knowledge that they can always make different choices in the future. And those choices will quite likely include classes, teachers, and books! I was happy to be part of a recent conversation on the online TV show For the Love of Learning, along with Pat Farenga and Pam Sorooshian. We covered many interesting topics, and I was left feeling like there was so much left we didn't get to explore. While I don't agree with everything my co-guests had to say, I was still blown away by many of their insightful comments and stories, and was thrilled to be included in such good company. I hope you enjoy watching this as much as I enjoyed doing it!